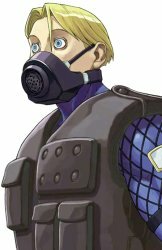 Holger, the man who would become Doctrine Dark, once served under the orders of Guile with his own special tactical reconnaissance unit. During a tour of duty, his own unit got into a bit of a scuffle with a rival unit, lead by Rolento. The minor scuffle escalated into a full-on battle, with both sides receiving heavy casualties. 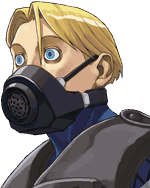 Doctrine Dark was the only member of his unit to escape alive. However, he was severely injured both emotionally and physically. Outfitted with a portable breathing apparatus, he eventually escaped from the hospital and went into hiding, only to re-emerge as the deranged psychotic killer Doctrine Dark. Dark holds Guile responsible for not training him well, accusing him of being more concerned with chasing after M. Bison to avenge Charlie than with the safety of his own men. This page was last edited on 3 November 2010, at 18:20. This page has been accessed 12,655 times.